Of the many hiking trails in rockland the Rockland Rail Trail is not quite as interesting as the trails of the town forest yet it is special. It has been a much anticipated trail, being part of the Rockland open space committee's plans for a number of years. 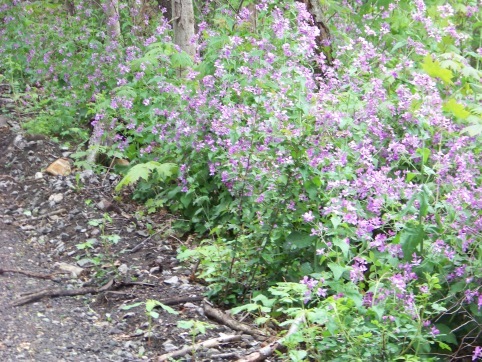 There are several things that make the Rockland Rail Trail special. It spans across Rockland in an East - West direction giving those who traverse it a hiking trail access to the center of town and it's schools. What I find special about the Rockland Rail Trail is that it is a connector trail. The hiking trails of the town forest are not far from it's crossing at Plain st. 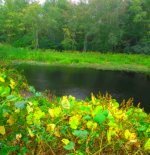 If you follow to it's westerly end in Abington you will again find yourself a short distance from the Town forest hiking trails. You will also find that Abington has had it's share of the tracks removed as well! The tracks cross over French's Stream another feature that runs through the town forest. 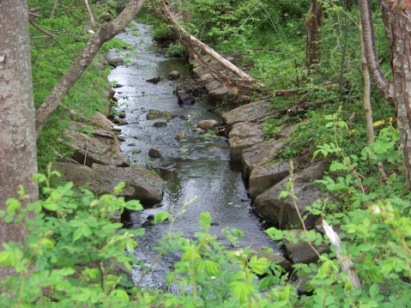 This stream is the source of much animal traffic and makes wildlife sightings on both of these hiking trails a high probability. of the Rockland Rail Trail heading toward Hanover. Trail spills out onto the rail trail. 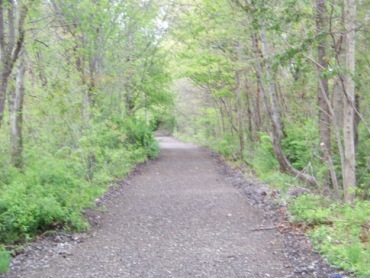 It is said that this rail trail is 2.5 miles in length. 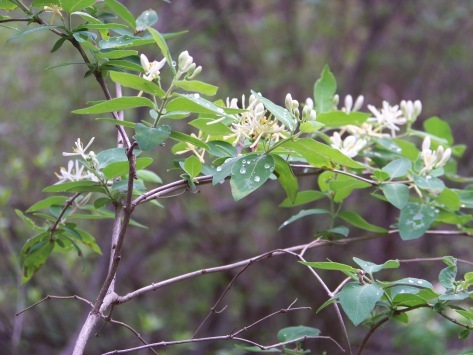 Yet, when I walked this trail in early spring, it felt considerably longer than that to me. Most likely because I did indeed add the side trail into what is called Melody Woods. This leads to the Colby Phillips trail which added possibly another half mile to my walk. When I came upon the trail junction of the side trail from the Rockland Rail Trail to the main trail of the Colby Phillips Trail I found a much needed bench. The section now paved spans from the intersection on Plain St to Howard St. The Senior Center has plenty of parking on the side of the building. This now paved portion makes the roughest part of the rail trail raised and level. Many visitors previously complained of the rough conditions especially in the spring. The asphalt is a very fine texture, making it a nice surface for strollers and inline skating. 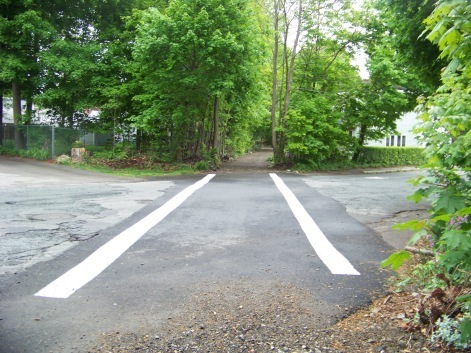 The paved portion extends into Rockland center where you will need to cross the street. For a short period the trail turns to course rock gravel, but an older concrete walkway runs parallel to this section. The paved portion then continues on to Howard St crossing. After that it continues as the original surface. I started my journey in Abington at the end of John St. This though not the end of the Abington branch of the trail is the most suitable place to park. There is a National Grid sub station at the street's end and space for a few cars to park. Just past the substation is a small path to the Abington portion of the trail. There is a well traveled path in to the utility lines and to the tracks. Once on the path you will pass over French's Stream you will find the Rockland portion , a gravel/crushed stone surface that is level and hard packed. Though this hiking trail was quite new when I took my first walk on it's entire length, there were many other trail users that I came across on my journey to explore Rockland's newest treasure. Some were walking dogs, one jogger and several others that were obviously using the non motorized way to get to where they were going in town. For some this may be the more convenient and quicker way to get around town. From Abington the first street crossing is at Plain st in Rockland. My walks on this trail in the summer proved that this section is considerably filled with bugs. Repellant is a must!! This portion also runs parallel to the Rockland Golf Course. The streets that the trail crosses are marked with their own crosswalks. The next portion of the trail runs behind many of the schools in the town. There is another small stream crossing. The bugs subsided at this portion. Once past the schools this portion of the trail opens up to the center of town. Here you can make a quick detour for snacks if needed. Or you can make this the food tasting tour as there are many restaurants and eateries worth checking out in the center of Rockland. Crossing the intersection you will find a Dunkin Donuts and the trail continues alongside of it. At this point the trail takes a bit of a south easterly dip. There is a crossing at Howard st and then shortly thereafter on Vernon st. The trail starts to become more wooded at this point. Another crossing at Liberty st where you will need to follow through an easement behind a convenience store, Honey Dew coffee and Themis Pizza (another detour when hungry). You will then pass the entrance to Rockland Police (they do police this trail by motorcycle). This is the last stretch of this hiking trail to it's end at Hanover. About 3/4 of the way down this portion of the trail, one of the residents on the left has the lower portion of a bird bath on the side of the trail. Just past this marker on the left you will find an unmarked trail. This is the trail that leads to Melody Woods and the Colby Phillips Trail in Hanover. If You take this trail there will be a water crossing that is a bit difficult to cross. There has been no formal trail work here. You will then come to a trail junction, taking the trail to the right and keeping to the right will bring you to a bench at the side of the lower portion of the Colby Phillips Trail. A loop can be made by following this trail to the right to it's end. You will find yourself on a dirt road covered by grass that makes you feel like you are entering private property, but it is a right of way that takes you to Circuit St. The rail road tracks are at the end of this street. You can follow them back to the cleared portion at the Rockland border. 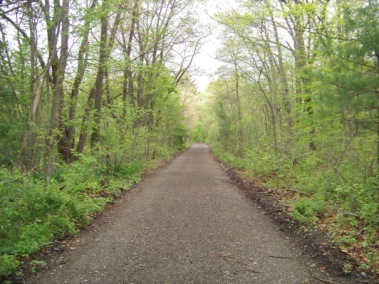 The Rockland Rail Trail is a favorite to walk bike and jog. Pushing a stroller is a bit bumpy but not difficult. The trail is closed to motorized vehicles and is open from dawn to dusk. Another hope of the rail trail advocates is that Hanover will also take the opportunity to clear their tracks. 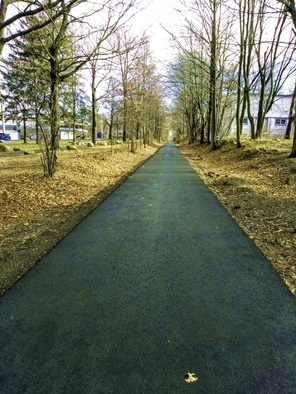 There is an estimated 8 miles of additional rail trail and another trail connection that can be made. Most likely this will be done as it appears to be on the Hanover Greenway Project plans. 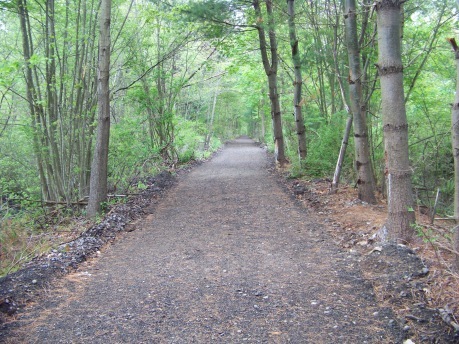 The actual work of making the Rockland Rail Trail was done by a non-profit company called Iron Horse Preservation. They remove the tracks and ties and grade the land at no cost to the town or the state. Hopefully the other towns will contact them and make use of their services! Look here for more information about the HISTORY of the Rockland Rail Trail and the source of some of this material. from Boston take route 93 South and route 3 at split. Take exit 14. At end of ramp take a right on Hingham St. Follow to end and right on Webster St (route 123). Follow route 123 taking the left on to East Water St. Follow East Water into Rockland Center. Trail runs along side of Dunkin Donuts and across toward Abington. Park on Hotel side of Dunkins. In Center of Rockland, at one of the many parking spaces in the center or at Dunkin Donuts eastern lot away from the door. John st in Abington (past the town forest near laundromat) Route 139 west. End of Circuit St in Hanover. Follow route 139 east, take left at lights at Circuit and another left on lower leg of Circuit. Dead end with path to rail trail.